Cauliflower, just like the name suggests, is a large flower belonging to the cruciferous vegetable family (think broccoli, cabbage etc). The standard cauliflower is white, resulting from the flower being hidden by the leaves wrapped around it, preventing sunlight from reaching it and making it green through photosynthesis (photosynthesis produces green chlorophyl pigment making veggies green) . It also comes in orange, purple and green colours, the result of mutation. I use it mostly during the spring and fall when it is particularly abundant at the markets. 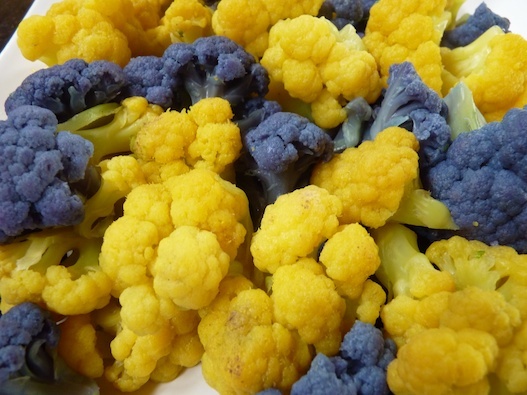 This week I picked up white and orange heads of cauliflower at the market in Kelowna and used some of the yellow florets, roasted with a bit of olive oil, in a quinoa salad for lunch the other day. I often roast cauliflower florets because roasting brings out the natural sweetness in them and it’s an easy and clean preparation. I do however, like to sauté cauliflower as well. There is something about sautéeing the florets in olive oil until golden, with sprinkling of salt, that brings out wonderful flavours in this veggie. Mercato in Calgary had sautéed cauliflower on the menu as a side dish and I had one almost all to myself at lunch a few weeks ago. 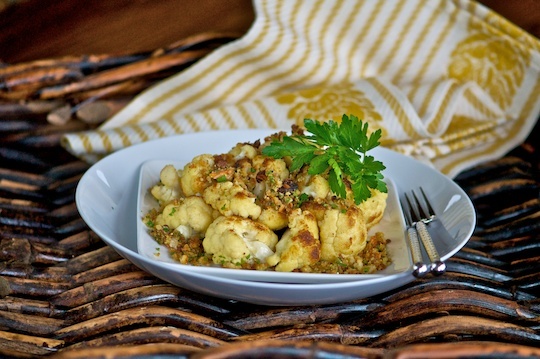 Cauliflower is very versatile and ways of preparing it are limited only by the imagination. Every culture has cauliflower recipes, making it truly a global vegetable. I sometimes dress cooked cauliflower with various sauces, from cheese sauce to curry to tahini to vinaigrettes and more. I also make it into soups, add to pasta dishes, combine with grains or serve it simply steamed with a drizzle of butter and a squeeze of lemon. 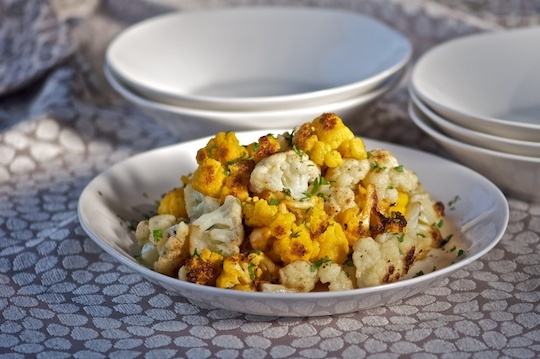 This recipe however is for a simple cauliflower sauté and it’s delicious served minimalist style just like that. Garnish with chopped parsley and a sprinkling of herbed crumbs and serve with a couple of lemon wedges. Heat olive oil in a large skillet, add yellow cauliflower florets and cook over medium high heat, stirring occasionally, until golden. Sprinkle with salt and pepper and hot pepper if using. Add 1/4 cup of the stock or water, cover the skillet with a lid and finish cooking the cauliflower until soft but still retain texture. Remove to a dish and keep warm. Add more oil to the skillet and add the white cauliflower. Saute the white florets until golden. Add salt, pepper and hot pepper if using, then add remaining 1/4 cup stock, cover and cook until done but not mushy. 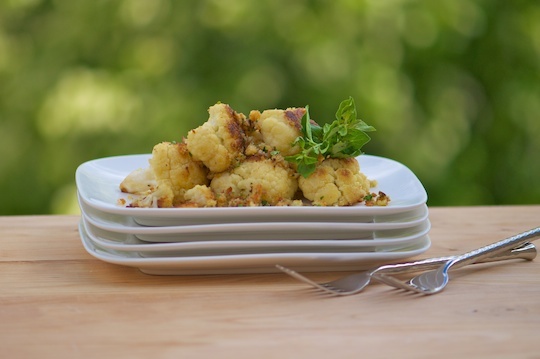 Combine both cauliflowers ands sprinkle with herbed crumbs and chopped flat leaf parsley. Taste and add more salt and pepper as necessary. Serve on its own or as a side vegetable dish. What an attractive bunch of florets, it almost looks like a wedding bouquet. I love the contrasting assembly. 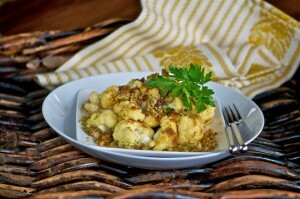 Thanks Dori, cauliflower is wonderful roasted or sautéed. Also – I changed clinging to clanging, thanks for catching it. I look forward to Friday lunch.